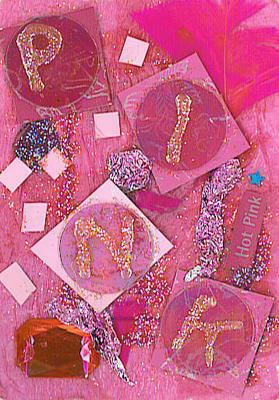 When completing a page in a friend's themed "Pink" deco, I was inspired to make an artist's trading card to go along. Mixed media collage. Quite sparkly and textured with lots of depth. Layers of paper, feathers, rhinestones, foil, and other ephemera. A fun project for a girl who never understood the concept of "Pretty in Pink". This piece measures 2.5 x 3.5 inches and its base is a standard sized playing card.